Finally formed, domed, soldered and polished, these little gems are now finished. Although intended for gents, I think they are small and pretty enough to work for the female wardrobe too. They are completely handmade and hand-finished, even the toggle bar has been cut, shaped and finished by hand. They are unique and unusual and I am really pleased with the way the idea of using fossils as an inspiration for design has worked, particularly now the pieces are all coming together so well in silver. Having experimented with a pair of stylish cuff links to determine how well the beauty of nature’s design could be incorporated into my work in silver, I was so pleased with the outcome that I just had to continue the theme with additional pieces. 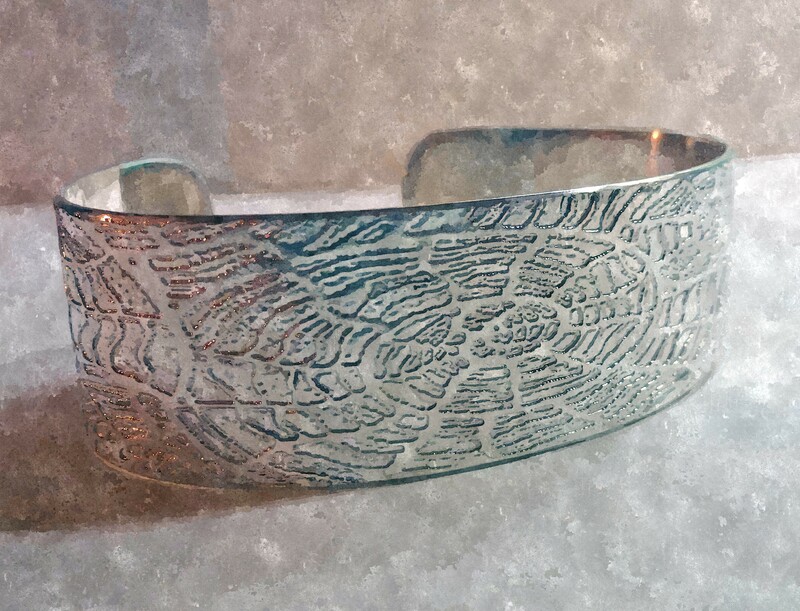 I have had some success in the past with my cuff bangle designs and so I wondered how best I could incorporate the detailed patterns so typical of an ammonite fossil shell onto such a piece. I wanted to capture the delicate tracery of the swirling surface markings in as much detail as possible in an attempt to create a mosaic-like effect on the surface of the silver. I have found that etching the silver produces pleasing and fairly consistent results, but this time I feel the effect was truly special. 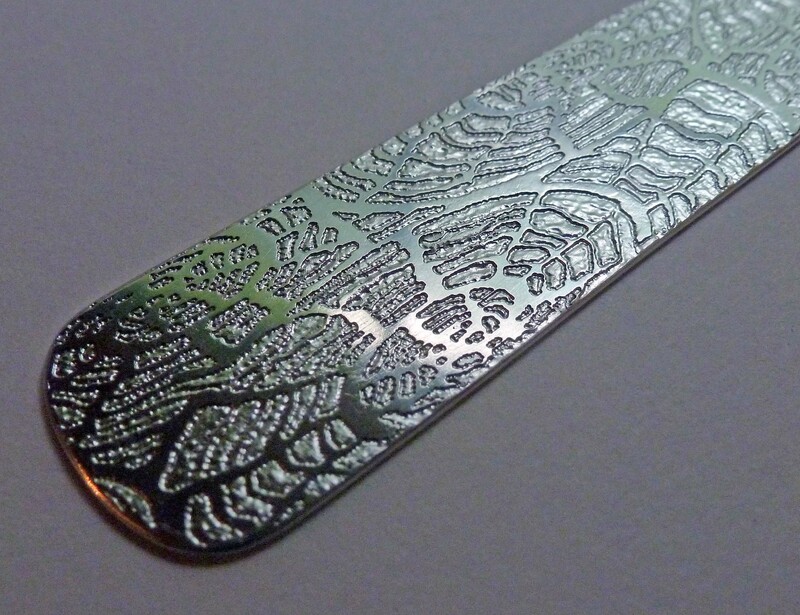 You can see below the strip of etched silver shortly after the resist had been removed using a brass brush in warm soapy water. The etch is so sharp and clear that the seamless pattern of differing sized fossil images across the surface really make an impression and the fine lacework of lines have achieved the mosaic effect I was looking for; I am hopeful that once polished, the finished piece will be quite beautiful. The next step was to clean up, shape and finish off the sharp edges of the silver sheet by filing, emerying with wet & dry paper and finally polishing before the piece can be shaped to snugly fit the wrist. Below is a close up of the work in progress. 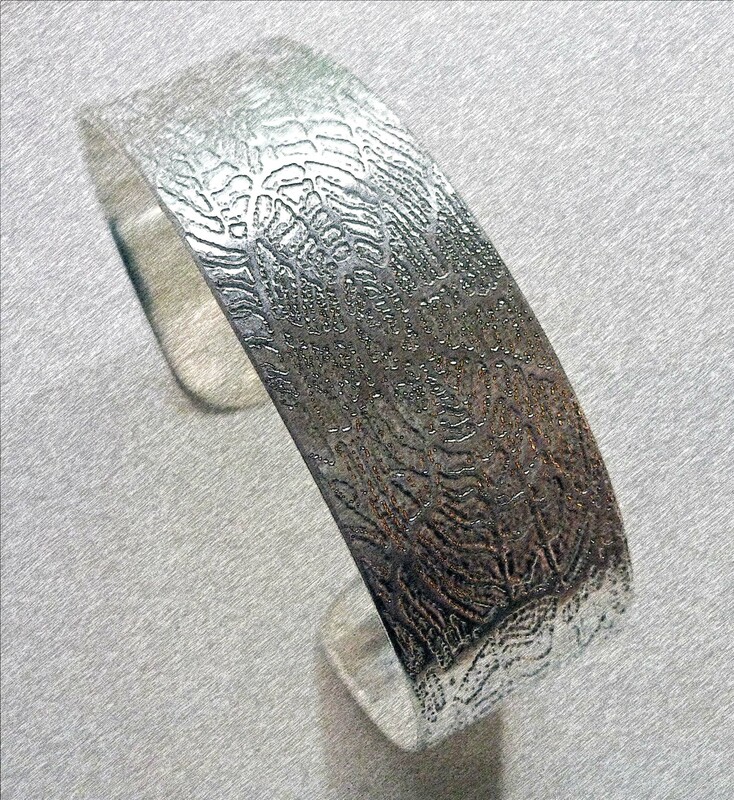 Fortunately, the sheet metal had already been carefully annealed before work began and so was still soft enough to easily shape on a bangle mandrel; no further heating was required and some gentle forming with a raw hide mallet rendered the decorated piece of flat sheet into a perfectly beautiful cuff bangle. Now all that is left to do is give this a pre-polish with Tripoli, clean off the residue and then give the whole piece a final polish up with jeweller’s rouge to leave it sparkling. Can’t wait to see the finished piece.